It's been an exciting week in Twin Cities Theater with much discussion about representation, access, inclusion, intent and impact. Check out our round-up below! 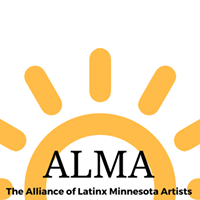 First up, "Artists of Today Intersecting Systems from Yesterday" a fantastic discussion by the Alliance of Latinx Minnesota Artists at Mixed Blood Theatre Company. Check out a short video with some highlights, and an audio recording of the event. Jay Gabler at City Pages Minneapolis wrote a lovely, fair and even-handed account of the discussion. The Star Tribune rightly calls the discussion: "Tense and awkward." Our own TCTB Compendium - Minneapolis asks "Where do we go from here?" 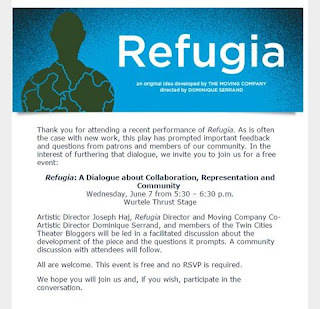 If you've not read Kory LaQuess Pullam's review of Refugia in Minnesota Playlist, you definitely must do so. Please stay tuned! Such exciting discussions are happening in Twin Cities Theater, and we want to keep the momentum going. We've got some plans in the works, and we'll be keeping you updated. Our thanks to everyone who is doing this "uncomfortable dance" together (tm Marcella Lorca at ALMA discussion).